JERUSALEM — The younger cousin took his allowance from his father on Tuesday morning and said he was off to school as usual. He and his older cousin decided to skip class instead. Now the pair, Ali Alqam, 12, and Muawiya Alqam, 14, have been arrested, accused of a copycat stabbing that wounded an Israeli security guard on a light railway train in East Jerusalem, not far from their homes in the Shuafat refugee camp and the nearby Palestinian neighborhood of Beit Hanina. Relatives said that the night before the attack, the cousins watched video clips leaked from the interrogation of Ahmad Manasra, a Palestinian 13-year-old who is about to go on trial, accused of participating in the stabbing of a 13-year-old Jewish boy and another Israeli civilian in the same area of East Jerusalem last month. Versions of the clip, broadcast on Palestinian television and distributed widely on social media, show Ahmad Manasra crying and pounding his head in frustration as an Israeli interrogator shouts questions at him aggressively, in Arabic. The attack on Tuesday appeared to reflect a looplike dynamic of Israeli-Palestinian violence: stabbings of Israelis followed by swift, often deadly responses by Israeli security forces and graphic video footage inspiring replica Palestinian attacks against Israelis. Even after dozens of such attacks in the West Bank, Jerusalem and other cities around Israel in recent weeks, the attacks involving children have stirred the strongest emotions on both sides. At age 12, Ali Alqam is the youngest of the accused Palestinians so far in more than a month of daily violence. He was shot by the wounded security guard and taken to an Israeli hospital in serious condition, according to hospital workers and the police. Muawiya Alqam was arrested unharmed. speculated that the Israeli security services had leaked the clip to frighten other youths and deter them from doing what Ahmad Manasra was accused of having done. Instead, they said, it fanned Palestinian outrage. Leah Tsemel, an Israeli lawyer representing Ahmad Manasra, said after the court hearing on Tuesday that her client had admitted setting out to scare and harm Jews but denied the charge of attempted murder, saying that he had not intended to kill anybody. Ms. Tsemel said that Ahmad Manasra, who was seen running with a knife in video footage released by the police, did not stab anybody, and that it was his cousin, Hassan Manasra, 15, who had done the stabbing. The court session was held behind closed doors because the suspect is a minor. Ms. Tsemel said the two cousins had agreed before setting out not to harm older Jews, women or children. 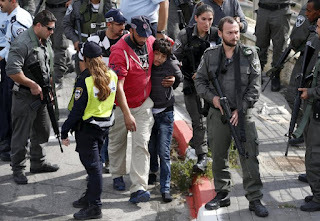 She said her client had tried to prevent the stabbing of the 13-year-old, who has been identified only by his first name, Naor, yelling at the cousin that it was “haram,” or prohibited. Hassan Manasra, who was seen on video last month running at the police with a knife, was fatally shot by officers at the scene. The attacks took place in Pisgat Zeev, which Israelis describe as a Jewish neighborhood in predominantly Arab East Jerusalem, but which the Palestinians and much of the world consider an illegal settlement. It sits in territory that Israel conquered from Jordan in the 1967 war and then annexed in a move that was never internationally recognized. Naor, stabbed in the neck as he left a candy store on his bicycle, arrived at a hospital in critical condition but has since been discharged. Soon after that attack, Asi Gabai, 42, who owns a toy store next to the candy store in Pisgat Zeev, described tearfully how Naor, bleeding, had staggered over to him and begged, “Save me,” and how a customer had helped stop the flow of blood. The case involving Ahmad Manasra had already become the most high profile and emotional among the attacks that began on Oct. 1, aided by video images and their diverging interpretations by leaders, news media and social networks on each side. In one clip from the scene of the attack, Ahmad Manasra was seen sprawled in the street, bleeding profusely from the head as Israeli passers-by verbally abuse him. President Mahmoud Abbas of the Palestinian Authority caused an uproar by asserting on television that the boy had been killed in cold blood. Before Mr. Abbas’s television address, however, the Israeli authorities had released video images and photographs of Ahmad Manasra in an Israeli hospital bed, recuperating after a vehicle ran over him and at least one Israeli beat him as he tried to flee. Prime Minister Benjamin Netanyahu of Israel accused Mr. Abbas of lying and called the episode an illustration of what he described as an inciting and false Palestinian narrative. Palestinian officials say Israel’s occupation of the West Bank and settlement construction are the triggers of violence. They have accused the Israeli police and security forces of adopting a shoot-to-kill policy that amounts to extrajudicial executions of Palestinians accused of stabbings or attempted stabbings of Israelis. In several cases with no video corroboration, Palestinians have insisted that no stabbings took place and have accused the Israeli authorities of planting knives at the scene. In the Shuafat refugee camp, where relatives of the Alqam cousins gathered Tuesday evening, many expressed similar doubts about the Israeli reports of the stabbing, although later on Tuesday more video emerged that appeared to show the boys attacking the guard on the train. Muawiya Alqam’s father, Ahmad Alqam, another of Ihab’s brothers, said he got a call from a lawyer asking for clothes to be brought for the boy to the Russian Compound, the Israeli Police Headquarters in downtown West Jerusalem. But there was no sign of contrition in the refugee camp, nor any indication that the adults might restrain their children. Sheikh Abdullah Alqam, a local leader and another member of the extended family, said he believed that Ali Alqam had been killed by Israeli fire, not wounded, until proved otherwise.